Performers include: Mark-Paul Gosselaar, Gloria Reuben, Currie Graham, Melissa Sagemiller, J. August Richards, Jonathan Scarfe, Teddy Sears, Jane Kaczmarek, Stacy Hall, Natalia Cigliuti, Paul Joyner, Wayne Lopez, Jon Polito, and Angel Oguendo. This legal drama follows a group of law school classmates who work on opposite sides of the courtroom. 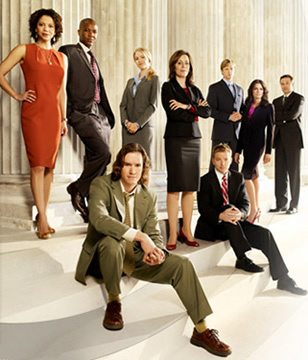 Idealistic Jerry Kellerman (Mark-Paul Gosselaar) is a public defender who brings compassion and boundless energy into the courtroom. He’s always ready to defend his clients, no matter what the charged. Jerry quarrels with the judges when they put process ahead of justice and he’s not always the most polished, but that’s part of his charm. The lead defense attorney is Rosalind “Roz” Whitman (Gloria Reuben). She may seem like a pushover at first, but she’s anything but. She mostly works behind a desk, but doesn’t hesitate to try a case when she’s needed. Richard Patrick Woosley (Teddy Sears) also works in the public defender’s office, though he could have been a high-priced corporate lawyer. He struggles to let Roz know his true feelings. Roberta “Bobbi” Gilardi (Natalia Cigliuti) is the most recent addition to the public defender’s office. Her first year was tough, as she was also pursuing a divorce from her drug-addicted, abusive husband. Through this experience and her case work, Bobbi’s learned to work the system, and she and Jerry began a relationship. Marcus McGrath (J. August Richards) is a great friend to Jerry, despite the fact that they’re often on opposite sides of the courtroom. He’s a brilliantly talented prosecutor with a strong sense of morality and responsibility. Marcus brings these qualities into the courtroom and refuses to be lenient to the defense, no matter how difficult the circumstances. Nick Balco (Currie Graham) is the lead prosecuting attorney. He likes a good challenge and loves to stick it to the other side as much as he can, especially Jerry and Roz. He has a sardonic wit and will use it whenever he can. He’s equally smarmy, ruthless, and brilliant. Michelle Ernhardt (Melissa Sagemiller) is determined to prove that she’s a great prosecuting attorney, not just a beautiful blonde. She’ll do whatever it takes to win the case, even if it costs her friends. Unlike Jerry, Judge Trudy Kessler (Jane Kaczmarek) sees law as black and white, though she spent her early career as a public defender. She doesn’t allow either side any wiggle room and doesn’t allow others to see her vulnerable side. She had a romantic relationship with her law clerk, Charlie Sagansky (Jonathan Scarfe), until he ended it by coming out of the closet. Charlie hopes to become a judge in his own right someday, and he and Judge Kessler often play scenarios back and forth as she shows him the ropes. I was just talking about this show today. It was a really great show and I still don’t understand why it was cancelled. This is why I don’t watch much TV. Great shows like this get the ax way too soon while silly reality shows stay on and torture us for far too long. Great job TNT for ruining TV this summer. I hope some other channel picks Raising the Bar up and it runs for 20 years. In your face TNT. This was an excellent show. What idiots. I loved it. Great show! Why cancel? its a nice show.